Take control of your listings and reviews with Mitro Digitals Local SEO & Reputation Management Plan. Explore what possibilities are available for you! Local SEO is the promotion of your Brand, products or services to local customers at the exact time they are searching for them. Local Search Engine Optimization not only brings traffic to your website but most importantly to your actual location, giving you another opportunity to make a sale. “Near Me” Searches grew more than 130% year over year. Local SEO involves making sure all your business’s information is correct across a multitude of directory listings that Google pulls information from to provide for “Near Me” searches. It would take you at least one hour for each listing if you chose to do it on your own. Here at MDM we can claim, update and monitor over 70 listings all at the same time. Having your name, address, phone number (NAP) and reviews easily accessible in areas of the internet that users are already searching for your information are huge key factors for rising in the ranks of web searches. Just as you see in the Google local searches. Why Review Management & Marketing? Simply put, people will shop or use services if others experienced an average to great experience. Years ago, most reference and customers coming through the door was because of word of mouth, personal recommendation, or a written publication & sales ads. But with only 20% of adults getting their news from print newspapers, gathering & marketing reviews has been a top priority in Local SEO. So, you can clearly see that having your business information correct and accessible as well as having average to perfect reviews can potential bring in a much higher return than most traditional advertising tactics. Take the first step in correcting and placing what your customers see. 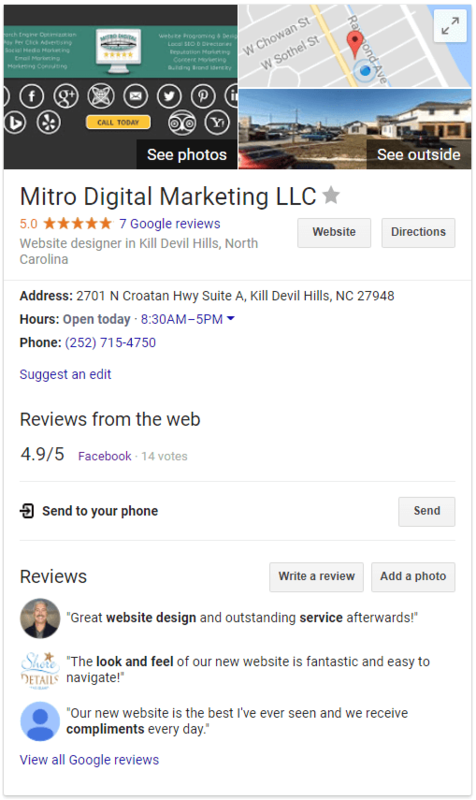 Take control of your listings and reviews with Mitro Digitals Local SEO & Reputation Management Plan.